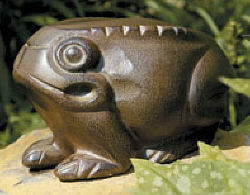 This little frog gazes sweetly out into your garden or over your lawn. A fun accent piece for your home, as well! Earth Tones That Will Fade to a Natural Grey.